Phoebe Natina started teaching swimming lessons at the age of 17, after learning from swim instructor Carl Eddington. 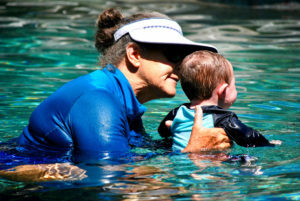 She has spent 40 years teaching and developing a method that would truly allow children to become safe and confident in the water. Today, parents drive from hours away just so their children can learn from her (sometimes even after trying other swim programs). Her teaching has become incredibly sought after in the area — in part because of her experience, and in part because of the specific swim teaching progression she employs. Swim Foundations was developed by Phoebe’s daughter, Nina, so that the Natina Swim Teaching Progression can be shared with the learn-to-swim industry to develop highly effective and confident swim instructors. Our aim is to help children everywhere be safer and happier in the water. The vertical float is a drown-proofing method that uses the breath and minimal movement to conserve energy and stay above the water. This method is the foundation of the Natina Swim Teaching Progression. It teaches students to take a breath independently, to get a feel for the water, and to be comfortable while fully submerged. 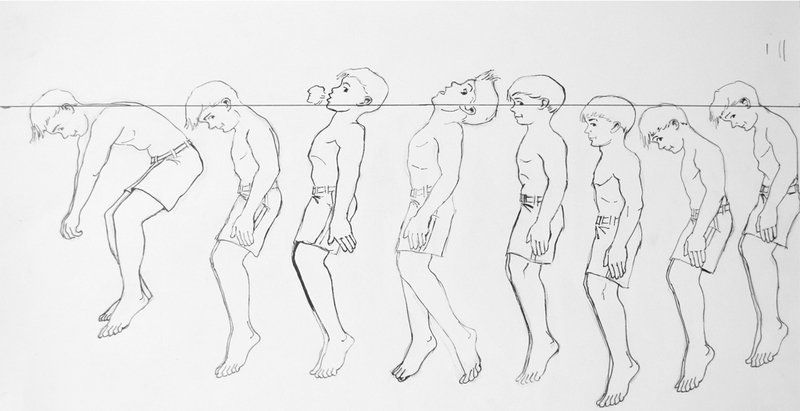 We use the vertical float to give students an instinctual understanding of buoyancy — something that is critical to developing a natural comfortable swimmer. Children have a natural tendency to enter the water feet first, and come up for air head first, and this method builds on that. In emergency situations, the vertical float has been used to enable an individual lacking strong swimming skills to survive in the water for many hours while awaiting rescue. We’ve developed a method of swim instruction that works — proven over decades of application — and we believe it’s essential that new instructors become trained in this method. Establish trust, challenge the child, have them practice what they’ve learned, and reward their success — this simple process produces children who are safe, comfortable, and confident in the water. We also believe in eight core values for swim instructors — compassion, fun, community, trust, discipline, confidence, courage, and sportsmanship. To work with kids, an instructor must look at them and see a tiny human, likely nervous and in need of encouragement. One must meet them where they’re at, and care enough to help them improve. Swimming isn’t just about safety, it’s about fun. Instructors must instill in children a love of learning and a love of water. Kids naturally have fun in the pool — let that fun remain, while maintaining discipline. Group dynamics can be an instructor’s best friend. Another child can challenge a student, inspire a student, teach a student. That’s why a great instructor understands and values community. A swim instructor should value trust. Trust between instructor and student. Trust between instructor and parent. A child that doesn’t trust won’t be in a frame of mind to learn. Simply put, trust makes teaching possible. There’s no learning without discipline. We teach our instructors how to maintain discipline in swim students so that they will truly absorb the crucial skills needed for water safety and learning to swim. An instructor teaches confidence partly by example —part of maintaining discipline and creating trust is projecting confidence for students to pick up on. Through experience and effective training, swim instructors acquire the confidence they need to be effective. Leaving Mom and Dad’s side to listen to a new person teach a new skill is tough for young children. That’s why it’s important for an instructor to care about courage, and know how to help their students develop it..
Once children have acquired some basic skills, we help them learn about competition by racing against each other and competing in games. For many of our swimmers, learning to swim leads to competing at the high school level, in college, and beyond. Learning sportsmanship is foundational in becoming a great swimmer, and a good human, which is why an instructor should understand sportsmanship and appreciate its value. Alice is the top performing manager for the highest-rated swim school in Austin, TX. She started her swim teaching career in her teens after shadowing her mom, Phoebe Natina, as a private instructor working with children ages 0-5, and now has over 20 years of experience in the swim teaching world. As Swim School Manager and Master Instructor at Nitro Swimming’s Bee Cave site, she manages a staff of 20-35 employees at a facility that teaches over a thousand students a week. In her role, she also participates in United States Swim School Association (USSSA) conferences. Before moving to Austin with her family, she was a director of a Learn-to-Swim Program for a private athletic club in Redding, CA, which acted as a feeder program to a competitive USA swim team. In her capacity as director, Alice developed curriculum for Parent & Tot, Group Lesson Learn-to-Swim, and Pre-Team programs. She also taught and directed school district Learn-to-Swim programs for K-2nd grade. Alice was recognized by Sierra Nevada LSC for 10 years of stellar service in the learn-to-swim arena. Alice has helped build from the ground up multiple programs that are now well established and thriving. Her expertise spans curriculum development, instructor training, and development of best practices for teaching swimming for ages 0-5. She has skills in management and leadership, payroll and scheduling, communications and planning with facility managers, business owners, and club members, and substantial experience in ensuring quality in swim education. We believe in BETTER SWIM LESSONS THROUGH BETTER SWIM TEACHERS. Our swim teaching method is founded on the principles developed by swim teaching legend, Phoebe Natina, who has taught generations of students to swim and to love the water. For professional swim instructors and learn-to-swim teaching programs in the U.S. and abroad, we offer online training webinars and in-person comprehensive and specialized training workshops. 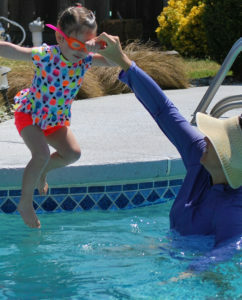 In the Redding area, we offer at-home private and small group swim lessons for ages 0-5, Parent and Me swim classes, advanced group swim lessons, adult learn-to-swim lessons, and more. Our mission is to cultivate highly effective swim instructors and enhance the quality of swim teaching programs in the United States.